Exploring Peru is an exciting adventure, but getting there doesn't have to be. Below there is information designed to make your arrival, stay and departure from Peru easier. Here you'll find information about your visit, from airports and visas, to currency, tipping and much more. A variety of airlines offer flights from North America to Lima including: Delta, American Airlines, United Airlines, LATAM, Avianca, Spirit and Jet Blue. Confirm your flights well before going to the airport. As well, you should check in at the airport at least two hours before flying for domestic flights and at least three hours for international flights. Check with the airline you are traveling with about luggage weight and size requirements as well as reimbursement conditions in case it gets lost. From the city of Lima, you can take domestic flights to the main tourist destinations of the country. Each airport charges a tax for the use of its facilities, called the T.U.U.A. or airport use tax, which is part of the price of your airline ticket. Minors are also charged. There are non-stop flights out of New York, Newark, LAX, Miami, Fort Lauderdale, Orlando, Atlanta, Houston and Dallas. All overseas flights from North America arrive at Lima´s Jorge Chavez International Airport (airport code LIM). An ideal time for visiting Peru is all year long because its cultural calendar is dotted full of traditional and modern activities, which sets Peru apart as a tourist destination. Some of the most important events during the year are the National Peruvian Paso Horse Contest in April, the Book Fair in July, the Lima Film Festival, which features the best in Latin American cinema, in August, the Feast of Saint Rose of Lima in August, and the procession of El Señor de los Milagros (the Christ of Miracles) in October, the greatest expression of piety by the Peruvian people. Another must see event is the Candelaria Festival, in Puno, on the edge of Lake Titicaca in February. Puno is a legend, a multicolored festival, and home to natural and artificial islands. Its inhabitants are proud of their Quechua and Aymara past, and their folkloric tradition that can be seen every year in the form of dances and rituals during the Candelaria festival. Find your way to Cusco, in June, to experience the Inti Raymi, the Festival of the Sun, which coincides with the winter solstice and harvest time. The ceremony takes place in Sacsayhuaman Fortress, where attendees follow a detailed script and sacrifice two llamas to tell the future. The Inca presides over the ceremony in Cusco's main square and demands that the authorities govern well. At sunset, the Inca announces the end and a merry celebration starts. Traveling to Peru is most popular from May through October (which corresponds to the dry season in the Highlands and Jungle regions). Regardless of the season and the place you wish to visit, it is advisable to bring warm clothing, comfortable pants, cotton shirts, hiking boots, tennis shoes, a good sun block and a hat. The official currency of Peru is the Nuevo Sol (S/.). The U.S. Dollar is accepted in some local businesses, restaurants and gas stations at the day's exchange rate. It is also possible to exchange foreign currency (US$ and Euros) at hotels, banks and authorized exchange houses. Working hours for most banks and exchange houses are from 9 A.M. to 6 P.M. Monday through Friday and Saturdays to 12:00 P.M. The country's main cities have ATMs that accept different kinds of debit and credit cards. The most widely accepted credit cards are: American Express, VISA, Diners Club and MasterCard. Travelers' checks have limitations, so we recommend consulting the establishment to see if they accept them or not before making purchases or ordering. The official languages are Spanish (80% of the population), Quechua (Andean and highland regions), and Aymara (in the Puno high plateau). In addition, there are around 50 native languages. It is possible to communicate in English with tourist services workers such as tourist guides, travel agency employees and 3 to 5-star hotels staff. Precautions against altitude sickness should also be taken when traveling to the Peruvian highlands, including Cusco and Machu Picchu. To avoid altitude sickness or soroche, we suggest you to ascend gradually in order to become acclimatized, rest on the first day of your arrival, eat light foods and drink plenty of water. It is highly recommended that all travelers consult their health clinic prior to travel to discuss a personal health travel plan. For more information, visit the Centers for Disease Control & Prevention / Peru. The amount of a tip will vary and depend upon how satisfied you are with the service given. An appropriate tip is considered to be 10% of the bill. It is advisable that you use the services of a taxi company (requested by phone). Cabs do not use meters in Peru. Tipping the cabdriver is not a common practice. It is wise to hire authorized taxi services at the airport. These have their own locations on the premises. The world’s main car rental companies operate in Peru. A good piece of information to know is that since the country’s terrain is so rough, 4x4 vehicles are the most requested. If you wish to drive throughout Peru, you must have your driver’s license, a copy of your passport, the vehicle’s registration, and if it is a rental, the respective contract. If you use an international driver’s license, these are valid for one year, so make sure to check the expiration date. Visas for entering Peru are not required for most countries in the Americas and Western Europe. The maximum authorized length of stay is 90 days. To remain longer in the country, or to enter for other purposes (residence, study, research, work, etc. ), you must request the corresponding visa at the Peruvian consulate of your country of residence before traveling. Seasons south of the equator are the reverse of those in the north, so summer in Peru runs from December to March and winter from June to September. 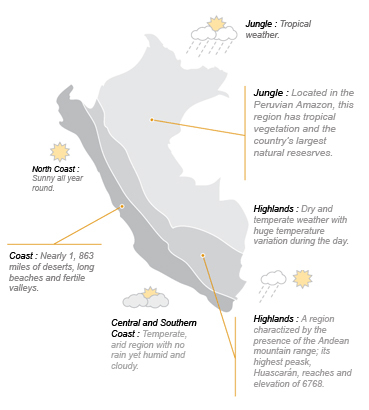 Peru’s climate is unique, varying from tropical in the Jungle Region to predominantly dry and mild along the Coast to frigid in the Highlands of the Andes.